a man he did not know, and who asked for a minute's conversation with him. When he stepped out he was immediately surrounded and all chance of escape cut off, five glittering revolvers being pointed at his head, though not one of the gang was courageous to attempt to arrest him. A large part of the afternoon was spent in an effort to effect his arrest, during which time many citizens of Loup City gathered around. Mr. Wall told them if he went with them he would not be given a fair trial, calling them a band of outlaws and cowards, and offering to take them one at a time and "lick the whole outfit" if they would lay down their arms, or if they would give him a chance to get his revolver from the inside, to give them a round with it. He was standing with his back against the building and with no weapon but his penknife, with which he was whittling a stick. They were so enraged at his remarks that finally they tried to throw a rope over his head, but each attempt to do so failed, and at one time one of them tried to take hold of him, but Mr. Wall struck at him with his knife with an upward thrust, ripping his vest from the bottom up. He appealed to the citizens for help and John Swain, son-in-law of J. C. Fletcher, who had recently come to the state in search of a location in the west, stepped up and offered to defend him with his life. Though the revolvers of the gang were leveled at his head, Mr. Swain did not flinch, but stepped fearlessly to Mr. Wall's side. Mr. Wall finally agreed to go with them if an officer of Sherman county and a sufficient number of citizens to protect him would go along, and suggested repairing to the court room, which was on the second floor in the Massasoit house. They all consented and a messenger was sent for Deputy Sheriff Reuben French. Mr. Wall, then county judge, busied himself with papers and put the county seal on some blanks he had filled out, in order to have the seal near for a weapon, and upon the arrival of the sheriff said, "I command you to call court." After quietly sending another messenger for Martin Brambaugh, Judge Wall commanded the officer to arrest the entire Olive gang for contempt of court, but when Mr. French tried to carry out the orders the outlaws pointed their revolvers at him and he weakened. They then grew desperate and determined to take Mr. Wall with them, but he said "county court is in session and I cannot leave." He was in this way trying to delay matters until Mr. Brambaugh and other citizens could get there. Two young men named Stringer came, as they had received some favor from Mr. Wall which they did not forget, and one of them slipped close enough to him to put a good revolver in his pocket. John Harkins came in with a sledge hammer in his hand with which he had been working, and although he did not intend to use it, it had a quieting effect upon the outlaws. "Mart" Brambaugh, in due time, came into the room, very much excited, and roared, "What is the matter here?" Judge Wall informed him he was deputized as an officer of the court to arrest the men who had caused the trouble for contempt of court, adding, "Here is my revolver," and laying it on the table. Brambaugh picked up the weapon with one hand and with the other took Bob Olive by the throat, saying, "You are my prisoner." The sudden and unexpected movement took the outlaws by such surprise that in a few moments they were all arrested, brought before Judge Wall, and fined for contempt of court, from ten to thirty dollars each. They agreed to pay their fines soon if allowed to leave and this was granted them, but these fines still stand unpaid on the court records of Sherman county. During the time Judge Wall was engaged with the gang, Mr. Roberts was in the house upstairs in hiding, with his wife and the Wall family, and the women were very much frightened. The strain upon Mr. Wall, which lasted several hours, was severe, but he demonstrated to the citizens of Sherman county that he was determined to defend the cause of justice and right at the risk of life. Frank Sueper, proprietor of one of the most valuable farms in Madison county, Nebraska, has been a resident of that locality during the past thirty years. He is prominently known throughout that part of Nebraska as a successful farmer and public-spirited citizen, and has a host of friends among the people of his community, by all of whom he is held in the highest esteem. Mr. Sueper was born in Prussia, December 13, 1848. His parents were Barnard and Elizabeth (Berg) Sueper, they being farmers in the old country, and Frank was reared on the home place. When he was thirteen years of age, the entire family left their native soil and embarked on a sailboat at Bremen bound for America. While on the voyage the ship was overtaken by a terrific storm and was wrecked on an island, all the passengers finally landing after terrible suffering from exposure to the elements. Here they were forced to remain for six months, living as best they might, obtaining food from the wrecked ship. One day a sailboat came to the island and took all on board, and they were taken back to Bremen, which was their nearest port, and from which the Suepers had sailed. They again set out for America in another sailboat, the "Theresa," and after a stormy passage lasting eight weeks, finally landed in New York. in 1881. They arrived in Madison county after a tiresome journey, and the father purchased a tract of railroad land, on which they erected a frame shanty, fourteen by sixteen feet, and set about developing a farm. Frank started for himself later on, in 1873, and was very successful for the most part, as he worked faithfully to build up a home, and after the usual hard luck and discouragements, became proprietor of a good farm, now owning a three hundred and twenty acre place, all in good shape, and is rapidly becoming one of the well-to-do farmers of his locality. Thomas J. Gilligan, a successful and prosperous rancher and farmer of Custer county, Nebraska, came to the county with no cash capital, but was possessed of energy and ambition, combined with a strong will to succeed. He is a self-made man and attained his present position through economy, industry and attention to details. He was born in Elizabethtown, New York, in March, 1860, third of the seven children born to John and Eliza Gilligan.. His brother John, a physician and surgeon, came to Nebraska some years ago and located in O'Neill, Holt county, and the two sons are the only ones of the six surviving children who live in Nebraska. The father died in New York in 1878 and the mother still lives in that state. Born and reared on a stony farm in the Adirondack mountains in northern New York, Mr. Galligan early learned habits of industry and thrift. He remained with his parents until reaching his majority. In 1878 he went to Iowa, and in the fall of 1881 came to Gage county, Nebraska, where he spent the winter. In the spring of 1882 he came to Howard county, where he remained until the spring of 1884, then filed on a homestead in Custer county. He worked in Howard county during the winter months of 1884-85, and in the spring of 1886 came to make it permanent residence on his new homestead. He also had a tree claim and began to improve and develop his land. He proved his title and added to his possessions from time to time until he was the owner of eighteen hundred acres. In 1911 he sold twelve hundred and eighty acres. In 1897 he moved from his homestead to another part of the farm of five hundred and twenty acres on section sixteen, township twenty, range twenty-one where he has a fine and well equipped grain and stock farm. There is a fine grove of trees on this place and some fruit, besides splendid hay and pasture land. This farm is located at the mouth of Big River canyon, and the home is very pleasantly situated. Taken as a whole, Mr. Gilligan believes, with good reason, that he has the best farm in his part of the county. Mr. Gilligan was married in Blaine county, Nebraska, in October, 1898, and six children were born of this union, one of whom is dead; and all of the others are on the home farm, making a fine representative family. They are named as follows: Ellen, Mary, Peter, Thomas, deceased; Jennie and Nicholas. Among the prosperous farmers and stockmen of Wayne county, Nebraska, a high place must be accorded the name of George Hofeldt. He is the owner of a farm in section four, township twenty-six, range three, and is regarded as one of the progressive and successful farmers of the locality, which has been his home for many years. Mr. Hofeldt was born in Cook county, Illinois, in 1861, and is the son of Henry and Elizabeth Hofeldt, both natives of Holstein, Germany. His parents came to this country in 1851, on one of the slow sailing vessels, and were on the ocean nineteen weeks before they arrived in New York. Mr. Hofeldt spent his childhood in Cook county, Illinois. In 1875, when he was fourteen years old, the family removed to Carroll county, Iowa. The parents remained in Carroll county, Iowa, on a farm, which they owned until their deaths. In 1884, Mr. Hofeldt and his wife moved to Wayne county, Nebraska, where a farm of one hundred and sixty acres was purchased from Bob Taylor. When Mr. Hofeldt purchased his place, it was raw prairie, and since then he has put it all under cultivation, and built a modern house, good barns and other out buildings. This farm is still occupied by the subscriber, who has made it his home since the above date. He has added one improvement after another, as fast as his circumstances seemed to warrant, and now has one of the finest farms to be seen for miles around. Of late, he has given considerable attention to raising stock, in which pursuit he has been successful. February 24, 1884, Mr. Hofeldt was united in marriage to Miss Maggie Peters, of Carroll county, Iowa. Mrs. Hofeldt was born in Holstein, Germany, a daughter of Claus Peters, her parents both dying in Germany. Mrs. Hofeldt came to the United States in 1882. Ten children have been born to Mr. and Mrs. Hofeldt. They were named as follows: Minnie, George, Louise, Bertha, Marguerite, Harry, Frank and Lester. Two died in infancy. Mr. and Mrs. Hofeldt are well known members of the community, and the number of their friends is limited only by the number of their acquaintances. Among the prominent ranchmen and stock raisers of Merrick county, Nebraska, the gentleman above named holds an enviable reputation. He is one of the old settlers in this section of the country, and has aided materially in the growth and success of the region in which he dwells. Reuben M. Wolcott was born in Lafayette county, Wisconsin, April 2, 1859, and was third in a family of seven children born to Mr. and Mrs. Oliver S. Wolcott, who reside in Central City, Nebraska. In the fall of 1861, Mr. Wolcott's parents moved from the Wisconsin farm to Western Iowa, where he received an education at the county schools, working on the farm during the summer months. He came to Nebraska in the spring of 1880 with his father and located in Merrick county, devoting himself to farming and stock raising. He is now located on the original Wolcott farm which he purchased from his father, and which consists of nine hundred and twenty acres of choice land located in the Loup Valley, on which are good buildings, and which is at well-equipped stock farm, on which Mr. Wolcott has bred Poll Angus cattle and is a breeder of Shire horses. He has been an exhibitor in the horse, cattle, and swine department in Nebraska, Minnesota and Wisconsin state fairs, and the Trans-Mississippi Exposition. On July 30,1903, in Merrick county, Nebraska, Mr. Wolcott was married to Miss Luella Adams, daughter of Robert and Amanda Adams, who were pioneers of Merrick county. Mr. and Mrs. Wolcott have one child, Ruby Evaline. Mr. Wolcott and family reside in their pleasant farm home, and enjoy the esteem of a large circle of friends. In 1903 Mr. Wolcott was elected a member of the state board of agriculture and re-elected in 1905 and again re-elected in 1908, and is an active member of the board. He stands for the best interests of his county and state, and is progressive along all lines. In his stock exhibitions, Mr. Wolcott has taken many prizes, and in stock circles is known in several states, and is prominent as an exhibitor. That the sphere of woman's activity has been widening rapidly cannot be gainsaid; that she is filling well her chosen part in the drama of life is equally self-evident. Of the progressive, efficient women of the west, not the least in mental and moral advancement is Mrs. Alice R. Armstrong, the editor of the "Butte Gazette," Boyd county's official organ and one of the most ably conducted country newspapers in the northern part of the state. Mrs. Armstrong was born in Blue Earth county, Minnesota, a daughter of Reverand N. E. Gardner, originally a minister of the United Brethern denomination; after which he was for over thirty years associated with the Congregational church. Her mother was Mary Pricilla Allen, prior to her marriage to the young minister. N. E. Gardner was born in Perry county, Ohio, December 24, 1833. He worked at the potter's trade when a boy and became an expert at it. He became converted in early life and entered the ministry when a young man. He was married in 1856 to Miss Pricilla Allen. He was licensed to preach in 1857 in the United Brethren Conference in Ohio. In 1863 he went to Minnesota as a missionary and located in Blue Earth county during the Sioux Indian massacre, where he was robbed of everything he had and barely escaped with his wife and little babes, while a number of his nearest neighbors were killed. In 1867, he moved to Missouri, where he spent several useful years of his life its preacher, presiding elder and financial agent for Avalon Academy. While moving from one work to another, he lost his loving wife and helpmate. Later, at Avalon, he married Mary A. Neeland, who was a strong christian character and a devout wife and mother. In the latter seventies he went to Illinois, where several years were spent laboring as minister in the Rock River conference. From here he went to Iowa where he labored as United Brethren Minister. In 1886 he went to western Nebraska and entered the Congregational. church, and continued preaching for that church during the rest of his work. In 1890 he went to Wyoming and held pastorate at Buffalo and Lusk. In 1893 he went to Silver Creek, Nebraska, and succeeded his son Jasper, who died while pastor of the Congregational church at that place. In 1895 he went to Arborville, Nebraska, and served as pastor for four years. In 1904 he went to Santa Cruz, California, and spent a year and a half. His health failing, he bought a little cottage home in the village of Arborville, Nebraska, where he and his faithful wife resided until he was called to his eternal home, April 29, 1911. He lived a very active life and his work was evangelistic, the greater part of which was spent on the frontier administering the kindly hand where help was most needed. He possessed more than ordinary talent as a speaker and was successful in winning many from sin to the better way. His success was the result of a life of consecration and a faithful presentation of the Word of God. His last sermon was preached to the boys at the state penitentiary in Boise, Idaho. Rev. Gardner was of a happy, cheerful disposition and scattered help and sunshine wherever he went. having undergone a serious surgical operation which he endured with wonderful fortitude. To the last he retained his spirit of cheerful hopefulness and courage. Together with his wife he spent the past winter in Boise, Idaho, visiting with his daughters, Mrs. Ferguson and Mrs. M. P. Meholin. As summer approached he became more anxious to get home to Arborville, Nebraska, and in spite of the earnest request of friends to protract his stay, he left Boise April 4th, intending to visit at a few points on his way home. When he reached Grand Junction, Colorado, the home of his daughter, Mrs. A. K. Moore, he was very tired. Instead of getting rested and able to resume his journey, he gradually grew weaker. He realized the fact that God was calling him home and calmly and peacefully responded to the summons. He asked what time it was, and added that the Master would take him soon. The minister's daughter taught her first school in Fayette county, Iowa, finishing out a term for her sister. On coming to Dawes county, she was one of the successful teachers there until her marriage to Mr. Thurlow S. Armstrong, then foreman of the "Dawes County Journal." The young wife at once took to newspaper work and assisted her husband on the Gordon paper, with which he soon became connected. They successfully published the "Valentine Republican," the "Norden Borealis," and "Ainsworth Journal," before trying ranch life in Brown county from 1889 to 1891. When Boyd county was thrown open to settlement, the journalistic couple saw in the new county a fine field for their editorial talent and removed to the county seat and for a year published the "Boyd County Banner." A year later they established the "Butte Gazette," which has been in continuous circulation since that time. Mrs. Armstrong assumed full control of the paper as proprietor, editor, and publisher in 1904, since which time she has been assisted by her daughter Hazelle. Since Mrs. Armstrong has taken the management of the "Gazette," there have been no less than five other papers started at Butte, none of which are in existence now, the last one, "The Boyd County Register" having been purchased by her in 1910, and consolidated with the "Gazette." Mr. Armstrong had been appointed postmaster of Butte in 1892, and was appointed to a third term, which Mrs. Armstrong finished out, having virtually been postmistress most of the time in fact, if not in name. A short time before the close of Mrs. Armstrong's term, the office was burglarized of twelve hundred dollars worth of stamps and cash, but eventually all was recovered, the thief having hid his booty near by, which from time to time was found in installments in various places of concealment. The culprit was well known, but lack of absolute evidence to convict prevented prosecution. The policy of the "Gazette" is republican, but it is fair to its opponents and avoids the rancor of partisan journalism. It is an ably-edited newsy weekly, and, being the official organ of the county, enjoys an extensive patronage in legal and official job work. Mrs. Armstrong is a member of three fraternal orders, the Rebekahs, the Royal Neighbors, and a widely extended literary association known by the, cabalistic letters of P. E. O. Sisterhood. In 1907 Mrs. Armstrong was elected president of the Ponca Valley Editorial Association, comprising the counties of Boyd and Keya Paha, Nebraska, and Gregory and Tripp, South Dakota, the meeting being held at Bonesteel, South Dakota. Mrs. Armstrong is the mother of two children, Hazelle and Kathryn. Albert Bowman Browder, for many years a successful and prosperous farmer of Boone county and later a resident of Albion, where he was engaged in the furniture business for a number of years, is now retired from active labor and enjoying every comfort of life after years of faithful toil. Mr. Browder is a native of Delaware county, Iowa, born January 2, 1852. He is the eldest son of seven in a family of eight children born to George R. and Mary A. Browder. He grew to the age of twenty years in his native country, then came by team and wagon to Boone county, and was one of the first homesteaders in that portion of the state. He had been married in Iowa, on March 6, 1872, and after getting located in Boone county sent for his wife, she arriving here in June of that year. Mr. Browder took up a claim on section thirty, and begun to build up a farm and home, and while he met with some hardships during the first years, in the main he was successful and accumulated a good property. He remained on his original farm up to 1888, then came to Albion for residence, engaging in the hardware business which he carried on for ten years. He then embarked in the furniture business and built up a good trade in that line also. Mrs. Browder died in Omaha on October 6, 1905, she having gone there to the St. Joseph hospital for treatment, and her death was deeply mourned by her family and many friends here. She was survived by her husband and one son, who is married and now lives in Albion. June 20, 1906, Mr. Browder married Mrs. Sarah Lewis, a childhood friend, in Iowa, and counted as one of the Browder family who came to Nebraska in 1878. In 1908 Mr. and Mrs. Browder left Albion and settled in University Place, which is a beautiful suburb of Lincoln, Nebraska. There they remained until December 1, 1910, when they returned to Albion, the old home, where they expect to remain. To the men of perseverence and stalwart determination who went to Nebraska when it was yet undeveloped as an agricultural and commercial region, the present prosperity enjoyed there is due. Among the early settlers of Antelope county who has been intimately identified with its development and has gained an enviable reputation as a citizen, may be mentioned William Ziegenbein. Mr. Ziegenbein was born in Prussia, Germany, in the province of Saxony, March 10, 1854, and was the third child in a family of six children. Our subject's father, Carl Ziegenbein, was born in 1827, in Germany, and after growing to manhood served in the army of his native land for eleven years in the war between Denmark and Germany. In 1870, our subject and his father started for America, sailing on the steamship "Westphalia" from Hamburg and landing in New York City where they stayed three days. They then left for the west to start where land was cheap, and came to Omaha, Nebraska, from where they drove to their claim in Saunders county, on which they built a sod house. While living here the family went through many hardships, and they had to go twelve miles by ox team to the Platte river for wood. In 1875 Mr. Ziegenbein was married to Miss Alice Briggs of Michigan, and to this union five children have been born: Mary, wife of E. Clark, has two children; Lizzie, wife of L. Buckminster, has five children; Pearl, wife of Ben McIntire; Nellie, and Carl, who is married to Miss Nellie Williams. A few years after his marriage our subject had bad luck with his crops, became dissatisfied with local conditions and moved further west, coming to Antelope county, Nebraska in 1881, where he took up a homestead in section twelve, township twenty-seven, range seven, on which he lived in a wagon until he could build a sod house. He has since prospered and is now counted among the substantial citizens of the county. Mr. Ziegenbein is well thought of in his community, and is a member of the Modern Woodmen lodge. In politics he is independent. In the death of Reuben E. Glass, who spent the last years of his life retired from active life, in Broken Bow, Nebraska, Custer county, lost one of its most valuable citzens [sic]. He had been a resident of the state since 1873 and during that time he had become well known and had made many friends who appreciated his character and worth. Mr. Glass was born in Detroit, Michigan, November 13, 1846, third of the six children born to Zenas and Sarah (Ferris) Glass, natives of New York. The father, who was of Scotch-Irish descent, died in Michigan, and the mother survives, making her home in Lincoln, Nebraska. Of their children: one son, Milton, died in the Civil war; one son, Edwin C., lives in Lincoln; one daughter, Mrs. Sarah Frost, lives in Lincoln; others are deceased. Mr. Glass grew to manhood's estate on a Michigan farm, receiving his education in local schools. He served in the civil war as a member of Company D, Twenty-fourth Michigan Infantry, where he won a creditable record, and after leaving the service returned to Michigan, where he engaged in business in the line of retail drugs. His first wife was Mrs. Lina Ferguson, who died in Michigan, leaving one daughter, Mrs. Lizzie Nichols, who has since died. In 1873, Mr. Glass came to Plattsmouth, Cass county, Nebraska, where he engaged in the drug business, and there, on February 3, 1876, he married Miss Margaret Louise Mitchell, who was born in Iowa and came to Cass county in 1874. She is the daughter of Francis P. and Margaret (Wright) Mitchell, the former a native of Greene county, Ohio, and the latter of South Carolina. The father, a physician by profession, died in New Orleans in the fifties, and the mother died in Iowa in 1845. In 1878, Mr. and Mrs. Glass moved to Kearney, Nebraska, where they spent two years, but on account of failing health he was obliged to give up his business, and in March, 1880, they came to Custer county and he took a homestead of one hundred and sixty acres on South Loup where they remained ten years. He also pre-empted one hundred and sixty acres of land, and in 1897 or 1898 purchased one hundred and sixty acres of land on section nineteen, township seventeen range twenty, although he never lived on the latter place, which Mrs. Glass now owns. In December, 1891, Mr. Glass retired from farm life and purchased a comfortable residence in Broken Bow, which continued his home until his death, October 11, 1905. He was survived by his widow, who still lives in the home, where she has every comfort and is surrounded by a large circle of sincere friends. Mr. Glass was a staunch Presbyterian in religious views and stood ready to help any religious or beneficial movement in his county or state. He died in the prime of life, and his death came as a shock to his many friends and acquaintances, by whom his loss was deeply deplored. He was regarded as a public-spirited citizen and highly esteemed by all. the fifth child of Amos and Polly (Walker) Fowler, who had five sons and two daughters. The father was a farmer and Alonzo Fowler was reared to farm work, receiving a rather meager education. He lived in his native county until he came to Nebraska in 1878. He was married in St. Lawrence county, September 30, 1871, to Amelia Durham, a daughter of William and Diana (Jones) Durham. They had three children born there, of whom two survive: One son, Ephraim, lives in Valley county, Nebraska, and Charles, in Idaho. Mrs. Fowler died in Hall county, in 1881, survived by her husband and three children. In October, 1878, Mr. Fowler brought his wife and their three children to Hall county, Nebraska, took up a homestead and lived there until March, 1884, when he came to Valley county. He purchased the southwest quarter of section twenty-five, township sixteen, range seventeen, which has since remained the family home. He has added about one hundred and sixty acres of land for every five years spent in the county and now owns eleven hundred and twenty acres in one body, lying along the northeast bank of the Middle Loup river near Arcadia, one thousand acres being in Valley and one hundred and twenty acres in Sherman county. It is one of the finest estates in central Nebraska and Mr. Fowler is an extensive stock and grain farmer, being one of the most successful men of his part of the state. At the time he first came to the county he had a total cash capital of about four hundred dollars, and he now handles a large number of cattle and hogs, making a specialty of feeding and shipping. He hauled the lumber used in erecting his first building from Grand Island, sixty-five miles distant, the trip taking five days. When he first came to the Valley the present site of Arcadia was not yet laid out as a town. Mr. Fowler's second marriage occurred at St. Paul, Howard county, October 17, 1883, when he was united with Mary Parker, a native of Ohio, daughter of Jeremiah and Orphie (Finlaw) Parker, born in Ohio and Pennsylvania, respectively. Nine children have been born of the second marriage, namely: Daisy, wife of John Tucker, now occupying the original home farm, has four children; Arthur F., Thurman G., Leota V., and Glowie M.; J. A., is married and lives on his own farm, and has one daughter, Opal Evelyn; Frank, Orrie, Nellie, Mabel, Gelnford (sic), Ralph, and Arnold, all at home. Mr. Fowler, who is a self-made man, beginning with little education, has forged to the front through sheer force of will and energy, achieving financial success and winning the respect and esteem of all with whom he has had dealings. He has reared a large family and still actively looks after his various interests. He and his wife have made several extensive trips east and west, enjoying the diversion offered in several of the larger cities and the change of scene. Their travels have extended from Montrose, Colorado, to Buffalo, Syracuse and St. Lawrence county, New York, as well "as parts of Pennsylvania, Ohio and Michigan. In the early years in Hall county, the family occupied a sod house for five years, and for six months on the pre-emption claim in Sherman county, lived in a dugout. Mr. Fowler was more fortunate than his neighbors in 1894, the year of drouth, harvesting about one thousand bushels of corn; his land, lying along the river, was underlaid with sufficient moisture to produce a fine crop. In 1898 an eighty-acre field of wheat was destroyed by hail, but the next year that eighty, with twenty acres additional, planted to corn, produced three thousand six hundred bushels which sold at ninety cents. His corn made twenty dollars an acre, his wheat twenty-three and his alfalfa thirty, which goes to show what sort of a farmer Mr. Fowler has been. He has always given much attention to stock, and the large herds grazing in big river pastures make a picture to gladden the eyes of an artist as well as, a stock man. We present on another page a view of the old homestead farm of Mr. Fowler, together with the other dwellings on his large estate. 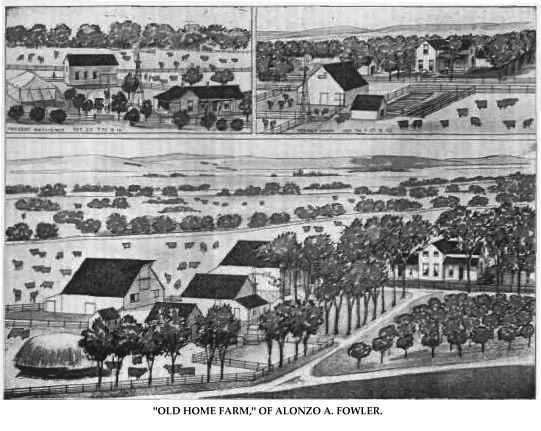 "Old Home Farm," of Alonzo A. Fowler. Prominent among the leading old settlers of Pierce county, Nebraska, is the gentleman whose name heads this personal history, who resides in section six, township twenty-eight, range three. Mr. Hoffart was born in the village of Kirch Brombach, Hesse-Darmstadt, Germany, May 4, 1863. He came to the United States in 1880, sailing from the Haven of Bremen on the steamship "Mosel," and landing in New York after a very stormy voyage of two weeks. He stayed in New York but four days, and then started for the west, arriving in Cass county, Nebraska, where he secured work on a farm and for four years followed this vocation, saving his earnings to make a start in life. In 1892 he came to Pierce county and purchased one hundred and sixty acres, the southwest quarter of section six, township twenty-eight, range three, to which he later added an adjoining quarter. He built a good frame house, and planted two acres of trees, besides making other improvements. He has one hundred and sixty acres in section seven and eighty acres in section thirty-one, of the same township, the two latter tracts being farming and grazing lands. burned corn when it was as low as seven cents per bushel and coal was high. Henry G. Hoffart was educated in Germany, where as a young man he learned the butchers' trade and later secured a clerkship in a banking and financial institution for one and one-half years. His father, Henry Hoffart, was a native of Germany, who sailed from Hamburg in 1882 for America, his son, our subject, having earned money to send for the old folks. The father plied his trade as baker for two years, then turned to farming. He came to Pierce county in 1893, and has a farm adjoining that of his son. Mr. Hoffart was married January 31, 1889, to Miss Barbara Horn, who is a native of the village of Zell, province of Hesse-Darmstadt, Germany. Her parents, Michael and Katherine (Heisel) Horn, were born in Germany in 1845 and 1848, respectively, and came to America with their family in 1886. The father served in the German army from 1869 to 1870, closing his military career after the Franco-Prussian war. The parents live with their daughter, who married Michael Hoffart, brother of Henry, who has a farm near him across the line in Knox county. Mr. and Mrs. Hoffart are the parents of six children, named as follows: John, Elizabeth, Henry, Mary, William and Fred. The family are of the German Lutheran faith. In politics Mr. Hoffart is a republican. He is a firm believer in sound financial institutions, and carries policies in the Bankers' Life and the New York Mutual companies, while his sons are equally prudent in the same way. Nels Nelson, for the past many years devoted to an agricultural career in Howard county, has a fine farm on section twenty-four, of Elba precinct, where he has made his name and influence felt as a capable and reliable citizen of his section. This gentleman was born in Sweden, October 18, 1859, and was the eldest in a family of ten children born to Nels and Annie Nelson. He grew up there, and was married at the age of twenty-five years, to Annie Hokeson, also born and reared in that country. In the month of January following their marriage, the young couple took passage for the United States, leaving there on January 10, 1886, and landing in New York City in the latter part of February, 1886, and from the time consumed in making the journey, it is plainly seen that crossing the ocean in those days was a more serious matter than it is today, when the trip can be made in five or six days. Mr. Nelson's first location was in Riley county, Kansas, where he secured farm work for a time, afterwards going on the railroad, and following that occupation for two years. In 1889 he came into Howard county, Nebraska, worked as a farm hand for a time, then rented a piece of land and began farming on his own account. This place was located on the North Loup river and owned by George C. Lothrop, and he lived on the farm for sixteen years, the same tract at the present time being farmed by Mr. Nelson's eldest son. Our subject purchased his present farm on section twenty-four, township fifteen, range eleven, in 1903, and this farm is a fine piece of land situated on the table land, improved with good buildings, etc. He has a well stocked up, and is recognized as an up-to-date farmer and progressive stockman. About two years after our subject came to America he was joined by one brother and a sister, and later two other brothers also settled in Howard county. In the spring of 1892 his father, mother, and two sisters also came over, all now living in Nebraska except one sister who makes her home in Illinois. Mr. Nelson's father resides in Greeley county, and his mother died there in February, 1910, aged seventy-six years. The father is now (in 1911) of the same age. Nine children have been born to Mr. and Mrs. Nelson, as follows: Gusta, married and living on the Lothrop farm; Martin, who rents a farm in Valley county; Mary, John, Louie, Harry, Willie, Effie and Archie, all living at home. They comprise a fine family, and all are popular with their associates. During the early years of his residence in Howard county Mr. Nelson was a member of the school board of district number two, and has also held minor offices in his precinct, always taking an active part in advancing the best interests of his locality. In 1902 he was appointed road overseer of his district, and filled the office to the satisfaction of all. Among the most prominent and prosperous farmers in Valley county, may be mentioned the above gentleman, at present residing in North Loup. He has been a resident of this county for more than thirty years and is one of the well known and highly esteemed citizens of this locality. Mr. Chase was born in Jefferson county, New York, on the twelfth day of February, 1837. He was the youngest of ten children in the family of Jacob and Asenath (Howland) Chase. Of his large family, only the subscriber and one brother (now living in Wisconsin) are surviving. The father died in Wisconsin in 1867. The mother died in New York state in 1853. Mr. Chase received his education in the local schools of New York state, and in 1855 went with his father and the other children to Wisconsin, and for a time was a student at Albion Academy, near Madison.